HREBA is actively recruiting new membership from qualified individuals, including community members. Apply by sending us your updated resume and letter describing your interest in health research or research ethics. As a community member of HREBA, you would help ensure that the information provided to research participants is accurate and easily understood such as the consent forms that patients need to sign before participating in a study. provide feedback in the design of documents and procedures. Community members, whether they are members of the general public or people who have participated in health research, play a vital role in helping HREBA’s committees review important aspects of a research study. They help to provide HREBA’s committees with the viewpoint of the research participants and help make their voices heard. Patients and caregivers bring an important perspective gained from their unique experience and knowledge of either living or caring for someone with a condition or illness, as well as from their experience with treatments and/or health related research. Community members are not expected to understand the science behind the studies; that’s the responsibility of the scientific members of the committee. All members of HREBA work together to simplify the research study protocols, so everyone can understand what the study is about and what is expected of the research participants. 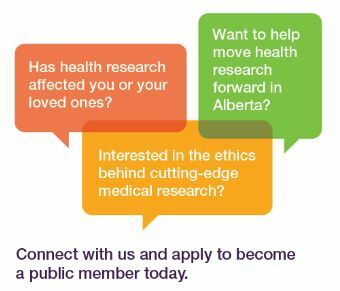 Becoming a member is an excellent opportunity to contribute to the ethical review of health research, to be exposed to leading edge of research development in Alberta, and ensure that Albertans who are involved in health research are treated with respect, dignity, and are freely informed of their participation. Members will take part in a mentorship process, and will be trained to gain a deeper understanding of health research ethics. Members receive honoraria for participation and are reimbursed for expenses related to meeting attendance. The positions are for three-year terms (2016-2019) and can be renewed. Members attend in-person at monthly committee meetings, either in Calgary or in Edmonton, with the two sites being connected via video conference. Community members can expect review two to three applications per month; the monthly commitment for review time and meeting time may total approximately six hours. The Cancer Committee (CC) reviews all cancer-related research in the province. The Clinical Trials Committee (CTC) reviews clinical trials, with the exception of cancer-related trials, conducted in the community by physicians or other qualified health professionals.